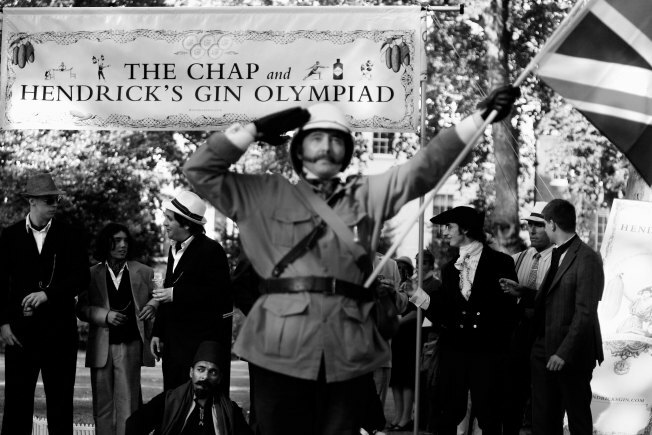 The Hendrick's Chap Olympics in London involves a very traditional British take on athletic events with Gin &Tonic jumping, three legged limbo, quill throwing and the pipe smokers' relay. It might be time to move beyond Tanqueray. And sure, Hendrick's is nice, but there's more to the juniper-scented liquor. Much more apparently. Madam Geneva, the gin joint behind Double Crown in NoHo, has 30 different gins on hand, and has just begun a bargain tasting special. A flight of any three gins is $18. Bar manager Brian McGrory has some advice on what gins — London dry, Dutch-style Geneva and New World — to try at Tasting Table. The lush AvrKo owned and operated bar is a pretty pleasant place to while away an afternoon or evening, though you'd best time your visit wisely. Despite pricey gin-drinks, the place was having no trouble filling up, with barkeepers having to literally pushing people out the door at 4 a.m. — Eater advises to avoid the "shitshow" by only tippling with the Madam on weekdays. Does Thanksgiving count as a weekday?